There are many options when it comes to designing curriculum that educates for sustainability. Some educators prefer to "sustainablize" their curriculum by working with the commencement edition of The Cloud Institute’s EfS Standards and Performance Indicators and cross walking and embedding them where and when appropriate. This also involves determining which ones are developmentally appropriate at each grade level. Others prefer we do that for them. If you would like to see how we would "sustainablize" our K-12 curriculum from the first quarter of Kindergarten to the last quarter of 12th grade, check out our new EfS Scope and Sequence. Educating for a Sustainable Future: Benchmarks for Individual and Social Learning will be released by The Journal of Sustainability Education on Earth Day, April 22, 2017. This 70-page account is authored by, and represents the current and best thinking of forty-two of the major scholars and practitioners of the field of Education for Sustainability (EfS). 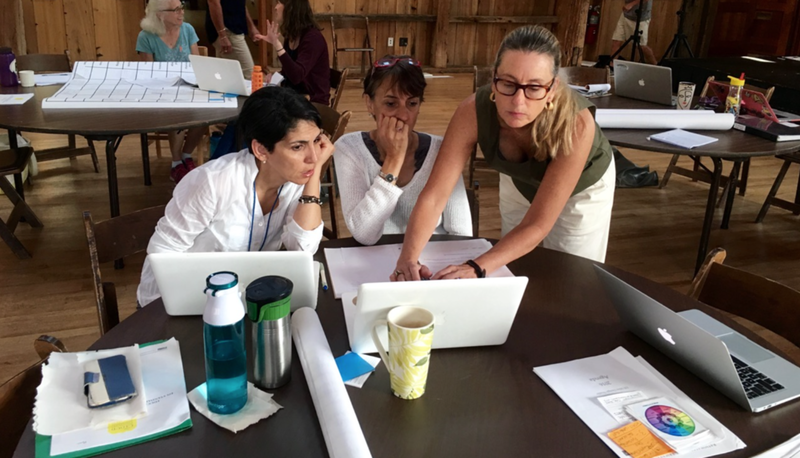 The Benchmarks include the Big Ideas, Thinking Skills, Applied Knowledge, Dispositions, Actions, and Community Connections that define Education for Sustainability. They embody the essential elements that administrators, curriculum professionals, faculty, board and community members need to adopt Education for Sustainability; to align with it; to self-assess their own performance, and to intentionally and effectively educate for the future we want by design. In addition, The Benchmarks embody the consensus that the field needs to demonstrate the impact of EfS and to catalyze wide spread implementation. Originally published on April 1, 2016 By Vicki So, Rubicon International on the Rubicon PD Update. "What kind of future do we want? What do we want to sustain? For whom? For how long? .... And what does education have to do with it? A fundamental part of the Cloud Institute’s mission is to inspire young people to think deeply about their relationship with the environment and to empower them to influence it. The Cloud Institute’s Framework for Education for Sustainability demonstrates the interdependence between students, educators, school systems, and communities at large. In order to achieve its mission, the Cloud Institute has embedded research-driven knowledge, skills, attitudes and habits of mind into the Education for Sustainability (EfS) Standards and Performance Indicators. In the three-part webinar series below, Jaimie discusses her work in partnership with the Rubicon-Atlas Curriculum Mapping software team and the NYC Department of Education. In particular, she explains why the curriculum mapping process is so important for bringing the EfS Standards to life [Download Jaimie’s top 10 reasons here]. Contact the Cloud Institute if your school is using Atlas and would like access, or email atlas@rubicon.com for support. In the first video, Jaimie defines sustainability and her work with the Cloud Institute [Click here to download presentation slides]. The second video highlights how the EfS standards come to life in the Atlas Curriculum Software and explains why the curriculum mapping process is important [Note: an open Q&A is included at the end of this video]. The third video provides an in-depth case study how the NYC-DOE has transformed their Career & Technical (CTE) program through the global Sustainable Development Goals created by the United Nations [Click here to download presentation slides]. Do you have a sustainability program at your school? Shoot us an email at pd@rubicon.com and share your story. If you are interested in learning more about trends in environmental education, click HERE! Tiger by Bud BlakeFrom classrooms to coffee shops, it seems that everywhere you turn these days, people are expressing frustration about the role that standardized tests play in our educational system. Parents, teachers, administrators and now even the US government are pushing back on the amount of time our schools spend preparing for and administering this type of assessment. In October 2015, President Obama and the U.S. Department of Education released a new testing action plan, acknowledging that, “In too many schools, there is unnecessary testing and not enough clarity of purpose applied to the task of assessing students, consuming too much instructional time and creating undue stress for educators and students.” This action plan recommends capping the amount of class time devoted to standardized testing at no more than 2 percent and promotes high-quality and innovative assessment practices. In response to public opinion and in anticipation of changes in educational policy, many school districts have already started prioritizing formative and performance-based assessments over standardized testing. Formative assessments help students and teachers track progress over time, providing ongoing instructional feedback. “I think a trend that will continue to grow is formative assessments that teachers can access on an ongoing basis, which tell them where kids are so they can adjust practice in real time,” describes Phillips. Performance assessments and portfolio reviews can be designed to give students many ways to demonstrate learning by showing us what they can do and what they create. Education for Sustainability (EfS) is a great fit for this trend since it is all about combining big ideas, knowledge and skill development, with being intentional about the difference we make through our actions. The good news is that we have strong data that shows that EfS improves student achievement, even on standardized tests. However, the sheer panic in public schools over test scores and the related employment implications coupled with the enormous amount of time people have devoted to test prep has severely distracted too many public school educators from being able to focus on educating for the future we want. And that’s bad news—if we want education to contribute to our ability to thrive over time. What is education for if not a healthy and sustainable future? Compass Charter School, Brooklyn, NY : First graders build, learn, monitor and teach about terrariums to demonstrate understanding of how living systems meet their needs. Kapalama Middle School, Honolulu, HI: Seventh Graders write extensive research papers and create biomimetic designs that demonstrate their understanding of the science and the design principles of Biomimicry--designs that solve human problems by mimicking the way nature has already solved them-- i.e., Water purification, eliminating toxic chemicals [in everyday household items], generating renewable, clean, green sources of energy, eliminating waste, constructing self-repairable buildings, clearing invasive species & cleaning up oil spills. Marin Country Day School, Corte Madera, CA: Fourth Graders participating in a “Council of All Beings” (they each make a mask and then wear it to council meeting-- to “become” the animal they want to represent) to demonstrate their ability to truly empathize with another living being. We invite those of you who have (or are looking for) high quality and innovative assessments for learning that authentically measure the extent to which you are educating for sustainability, to keep your eyes peeled and respond to our call for exemplars at the end of June. In partnership with The Journal for Sustainability Education, we are inviting educators worldwide to submit exemplars of curriculum units, courses, assessments, rubrics and other forms of explicit performance criteria, as well as student work samples (with aligned performance criteria) that meet the soon to be published EfS Benchmarks for Individual and Social Learning. At the end of the day, Education for Sustainability is all about performance, because thinking drives behavior and behaviors causes results. EfS is not an intellectual exercise but rather, to human and other life in perpetuity--a means to a non-end. The stakes are high and we need to know we are getting the results we need in order to turn “Spaceship Earth” around and head it toward the future we want.